There's a crippling problem with cosmological and teleological arguments. 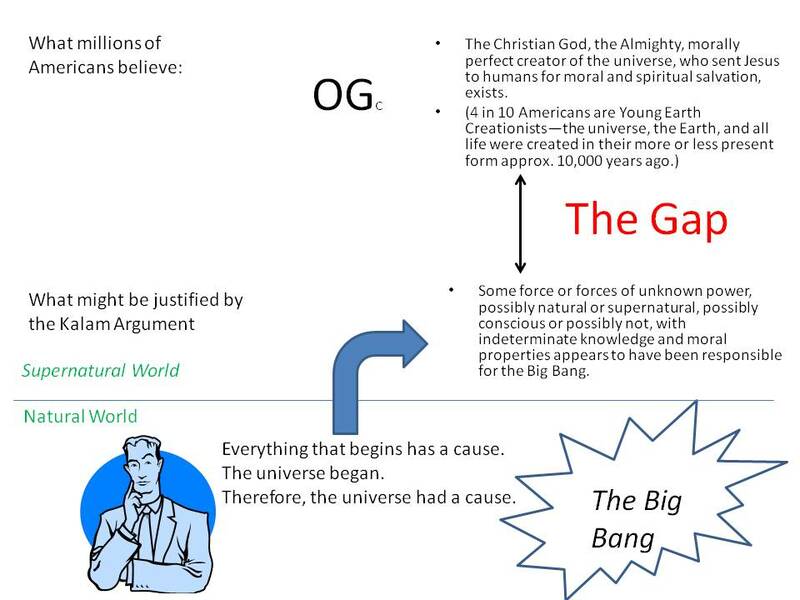 Even if they succeed at showing there was some sort of force or forces that caused the universe, or that played a supernatural causal role in evolution, or the fine tuning of physics to be biophillic, they don't show that it was God. That is, you can't get the God that people believe in--the all powerful, all knowing, all good creator of the universe, the God of Christianity, Allah, Jehovah, Jesus, and so on--from the argument. The arguments underdetermine theistic belief. I've been calling this The Gap. And the widespread consensus in philosophy now is that this is one of the central reasons that natural theology as it has been pursued for centuries, fails. Here's a slide I worked up recently to illustrate the problem more graphically. This reminds me of the first WLC debate I ever listened to. After he went through his Kalam argument, I thought -- so What? Does that make the Bible true? You've got a long way to go from there. 1) Since we value the truth, we should pursue that the best we can and if any or all of the arguments from natural theology are sound, but they only allow us to rational conclude that a supernatural being with properties x,y,z exist then that is what we should believe even if this forces us to give up strong atheism or perfect being theism. c) We have at least some viable or good reason to think that something approaching the truth of the yet to be confirmed aspects of a hypothesis is in principle reachable or we already have good evidence that approaches the implications or components of a hypothesis that has already been confirmed according to criteria (a) above. Unless we want to give up STR and Darwinian evolution I suggest we give up Hume’s Stopper if criteria a-c can be met by the project of natural theology which leads to point 3. 3) What is the current state of natural theology? Well, Quentin Smith defends a version of the Conceptualist Argument which would get you to an omniscient being if it was sound. The fine-tuning argument gets you an incredibly intelligent designer and moreover I would argue that if quantum indeterminacy is real then the designer has to have middle knowledge and I think there are considerations of the same argument that should make us think that the designer knows the future. The moral argument gets you a morally perfect being, and the kalam argument gets you a personal, singular, enormously powerful (if not all-powerful since the gap between being and non-being is infinite in the act of creation). So taking stalk, the arguments from natural theology get you AT LEAST 3 of the 5 directly (if not 4 or 5), and we have good evidence that approaches the remaining 1 or 2. What this means is that by criteria a-c above we are rational to believe that the hypothesis of an omni-god is probably true just as in the case of Darwinian evolution or STR. 4) The success of natural theology depends on which arguments you take into consideration. Obviously the ontological argument is a Stopper to Hume’s Stopper if we grant it as sound. That is, we would get to perfect being theism with a sound version of the Ontological argument and Plantinga’s may do the trick. Hume’s Stopper only works if we deny the ontological argument, force any other single argument from natural theology to do all the heavy lifting all by itself and ignore the fact that the arguments from natural theology constitute a cumulative case where no one single argument has all 5 of the Big 5 attributes in view but collectively they do. 5) If we include the case for the resurrection then we have confirmed Christian theism over and against any other candidate gods and abductively arrive at perfect being theology this way in conjunction with the other arguments from natural theology. 6) Even if the kind of ‘God’ that exists is ‘only’ personal, enormously powerful (capable of doing miracles), incredibly intelligent (has middle knowledge, knows that future, fine-tuned the universe), is morally perfect, and revealed itself in Jesus of Nazareth then such a God is still worthy of worship. 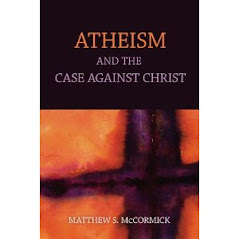 7) Indeed, if McCormick is correct (here I am alluding to his interview on commonsenseatheism) in thinking that the recalcitrance in coming up with a defintion for omnipotence and the work of Patrick Grim'm':) is plausible on omniscience, then it is logically impossible for 'God' to be omnipotent and omniscient. But then, the greatest conceivable being (the staple of perfect being theology) can no longer be conceived of as omnipotent and omniscient but rather enormously powerful and enormously intelligent which is safe to say, the conclusion of the kalam and fine-tuning argument. So, natural theology would get you to 'God' in that case after all. One way to look at the Gap, that I think is more telling, is this way. Imagine that Smith is falsely accused of murder and brought up on trial. In the trial, the prosecuting attorney gives a great deal of evidence that the murder was committed by some human or other. Perhaps it was even a mammal, or a group of humans and mammals, according to the information for the prosecution. Then the prosecution concludes: "Therefore, we have shown that Smith committed the murder and that you must convict him. It is reasonable on the basis of the evidence offered about humans and mammals to conclude that Smith is the specific individual who is guilty of committing the crime." Clearly, in a case where so much is left undetermined, we are not justified in helping ourselves to so many specifics as Truth Seeker seems to want to do. The Ontological Argument, however, as TS suggests, might not suffer from The Gap, if it worked. Although, it might show the existence of some maximally great being, it would not give us a justification for any specific Christian doctrines. It seems to me that it is perfectly reasonable, even mandatory, for us to demand in cases of great import that some real justification be given for religious doctrines. Truth seeker said: "I would argue that if quantum indeterminacy is real then the designer has to have middle knowledge and I think there are considerations of the same argument that should make us think that the designer knows the future." I don't know where you get that. I have studied QM all my life and there's nothing in QM that justifies your claim. If we take the Heisenberg Uncertainty Principle, which embodies most of the foundational concepts of QM, all we get is that one cannot measure the position and momentum of a particle simultaneously. How do you get from that, that God gets "middle" knowledge, whatever that is, and knowledge of the future, must one of the weirdest crackpot theory I've ever seen. zaybu: "Middle knowledge" is knowledge of propositions of the form "if X were to happen then Y would happen" -- especially in cases where the answer involves randomness, free will, or other (actual or imaginary) factors that mean you can't just *deduce* Y from X. For instance: "If Schroedinger puts that cat in that box, it will live"; "If I offer Mitt Romney such-and-such a bribe, he will take it". I think "Truth Seeker"'s argument goes like this. Suppose some "fine tuning" argument is successful. Then what it tells you is that some agent set up the laws of nature and the fundamental constants to bring about life (or intelligence, or love, or lots of black holes, or whatever exactly it is that's the focus of the particular fine tuning argument). But, if the world with such laws of nature as we actually have is irreducibly random, then doing that requires middle knowledge -- our alleged designer needs to have known something like "if I set up a universe with these laws and those fundamental constants, then it'll produce intelligent beings capable of love and worship and genocide". Why does whatever caused the Big Bang have to be "enormously powerful"? Those who bridge the Gap with God seem to be presupposing that the criteria of enormity here are just obvious. But I'm not so sure. Are those criteria relative to the kinds of causes (and agents) we find in our common human experiences? Is the implicit thought that none of us could create a universe, so whatever did must be a lot more powerful than we are? Here is a story I don't claim to be true in all details, but which might at least raise doubts about this "enormity premise": Once upon a time the whole universe was condensed into an area small enough to fit inside a Quantumizer brand benchtop quantum-space-time-foam manipulator. It turns out that randomly twiddling the dials on the Quantumizer can sometimes produce universes. Relative to the energy values of local phenomena within one of those universes, the total energy of the universe is enormous. But relative to the operations of the Quantumizer, the total energy of any of those universes is trivial. In this scenario, the knob twiddler doesn't turn out to be very God-like at all. Of course, this story takes a lot for granted. But does it really take any more for granted than accounts that bridge the Gap with God? I believe you're correct regarding most apologetic arguments. They seem to not be able to bridge "the gap" very much. However, I don't believe this is the case regarding Aquinas' Five Ways. I believe if any body bridged "the gap" then it was him. What are your thoughts regarding his arguments and their relation to "the gap"?